Monica M. Ruiz is the Program Fellow for the Cyber Initiative and Special Projects at the William and Flora Hewlett Foundation. In her work on the Cyber Initiative, she supports efforts to build a more robust cybersecurity field and improve policy-making. She also manages the foundation’s portfolio of Special Projects grants, part of a pool of flexible funds that allow the foundation to respond to unanticipated opportunities, explore potential initiatives, collaborate with other funders and facilitate cross-pollinating work across the foundation’s programs. Prior to joining the foundation, Monica was the first recipient of the Boren Fellowship to travel to Estonia, where her research focused on cybersecurity issues and she studied the Russian language. Earlier in her career, she worked at U.S. Southern Command in the J9 Partnering Directorate, where she served as the military education coordinator between the Command and partners in the region. 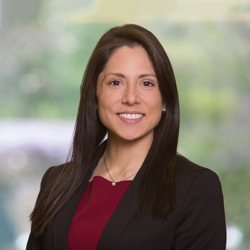 Born in Ecuador and raised in Miami, she holds a bachelor’s degree from Florida International University and a master’s degree from The Fletcher School of Law and Diplomacy at Tufts University.